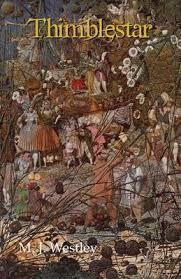 The cover illustration for this book is `The Fairy Feller’s Master-Stroke’ by mad, old Richard Dadd whose small, little-known oeuvre of work delights many. In an age when packaging is seen as essential to successful marketing this is indeed a master stroke all of its own. It is suggested in the preamble that this narrative was found among the effects of an old soldier deeply disturbed by his experiences in the Great War 1914-18, who abandoned his family to eke out a marginal living in an old wooden caravan. This recluse had the good fortune to hear a tale recounted by the faerie sort which he duly wrote down. Thimblestar is that tale. The written style is unusual. 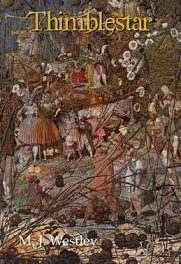 It deliberately sets out to convey the spirit of a faerie. It is part poetic, part rhyming, part rhetorical and part narrative. The story sets out to be different and it succeeds. This is in many ways as subversive a form of narrative as say, that of Chris Kelso. It is just more subtle, less in your face. Yet this remains the Outsider looking in towards humanity. This is the voice of the alien telling us humans about themselves, about their lives, their trials and tribulations. Many may find this challenging, whilst others will be delighted by the difference. During Thimblestar’s winter hibernation in the roots of her family tree, the hungry badgers have rooted through her possessions and destroyed her stock of Elfin tea. This is the very stuff which faeries imbibe so that they can travel the world unseen and thereby safe. Thimblestar has to restock, but to do that she has to cross the ancient wood to where the elves live. Having no choice in the matter she hitches a lift from a friendly bird, Cybris but they get bothered by a hawk fascinated by the tiny creature Cybris is carrying. After a damaging tumble, Thimblestar has to take the surface route. We then experience the tale of the hazardous journey. Thimblestar falls victim to predators but is also helped by other more, kindly beasts. There is the imp whose magic is just for the day, so she escapes, albeit eventually. Then there is the striving Hatat, the wood-sprite and his haulage toad which comes to a sad end. The experiences include two-way miracles as well. Thimblestar is able to save a human child, Vivien who had fallen into a well. An elf, called Jankin Galipot has a great kitchen which seems engaged in a version of an eternal bake-off. The sinister, opinionated goblin, Wudgut and his terrified servant, Mr Spiffle, or is he Mr Pipitop, living in the skull of a dead man are sufficiently disgusting to induce Thimblestar into reflections of her own life and family. It is these periods of self-examination going back to childhood, parents, family and friends which greatly improves the narrative as they add substance to the faerie existence. It is here that the Outsider itself looks inwards, in many ways setting riddles and challenges which can only be external to our experience. `There be a game in this somewhere. Tis but worldswork’. In all things there is an Outside that terrifies and intimidates, then there is the Inside where everything is not quite what it seems. This book creates opportunities for reflection which is probably the very point where it started. This story has all the elements of becoming a classic. Even if it just becomes a niche it will have achieved the purpose of giving the wee folk a voice.